First, how cute are those tacos? Limes that had a wedge cut out (which perhaps were sent off to some macrobrew event serving Coronas) were used as holders for the miniature corn tortillas. The chicken inside was extremely smoky in flavor, so we were wary of getting a smoke overload when sipping a smoked beer along with it. 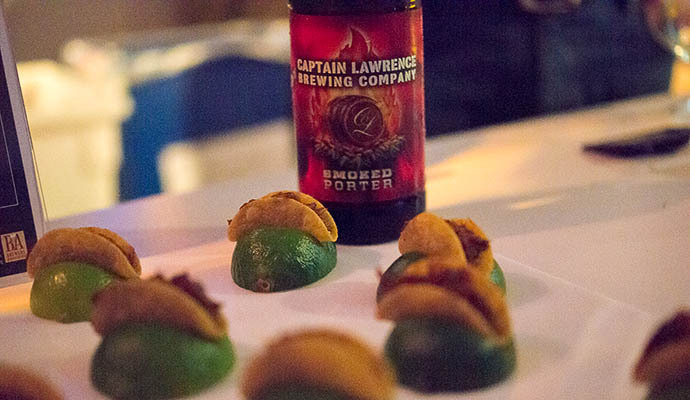 However, the porter from the Elmsford, NY brewery is malty and fruity, and was a round, sweet complement to the tangy taco bite. Smoke only really showed up on the palate at the very finish of the sip, and it was welcome.